2012 has been an epic year for me. Selling our house in January and eventually moving in June (after several hiccups), my first full year of working part-time, hubby's 50th birthday, holidays in Devon and in France, our 20th wedding anniversary and hubby working from home. Downsizing has and will continue to have a huge impact on our everyday life. Our finances are under control and are no longer dominated by hefty mortgage payments. A smaller, more energy efficient and easier to maintain home is a daily pleasure. There have been health scares amongst my family and friends and although these have tested us they have also brought us closer together and made us appreciate life more. And having more time means I can nurture these relationships more easily. 2012 has been a year of change and challenge but also of growth. I like my new life and the way it is enabling me to follow my dreams. I embrace all that 2012 has been and feel lucky. I have learnt that happiness is not about reaching perfection but about being content with your lot. 2012 was when I learnt that a life of less stuff and less status was a more meaningful life for me. Since the end of September, when I launched myself into blogging, you have been witness to this journey and I can't thank you enough for your support. I enjoy writing about minimalism and simple living and will continue to strive to make this accessible, interesting and relevant. I can't wait to carry on sharing this journey with you in 2013. Thank you all for reading, commenting, following and well... just being so lovely. 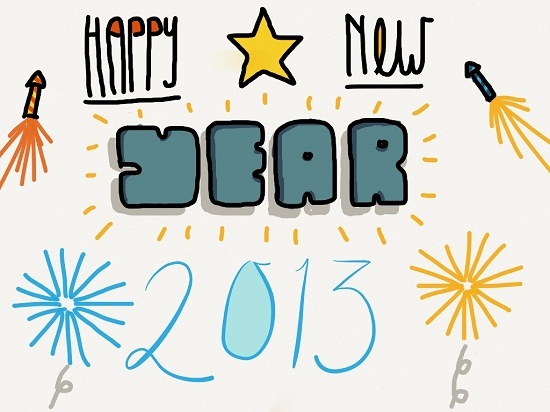 Wishing you all the best of everything for 2013. I'm so glad the big changes you have made in your life are reaping rewards. I will look forward to following you in 2013. The other day I sorted out my wardrobe and have reduced it dramatically following your lead, although not down to 33 items! It is a step in the right direction and I already feel lighter and freer.